The FireStik II FS Series Antennas feature upper coil extension to increase the power handling capability of the antenna. High performance coil maximizes the transmit/receive functions of your CB. These top-loaded antennas will also receive the NOAA emergency weather alert and national weather broadcasts for radios with those features. All FireStik "FS" antennas are compatible with autos, trucks, vans, motorcycles and ATVs in a single antenna configuration when metallic ground plane is available. Or, they may be used in dual (co-phased) configuration on any vehicle made from any type of material. The patented design broadens the antennas bandwidth to keep SWR lower over more channels. FireStik 3' FireStik(R) II "FS Series" Tunable Tip CB Antenna requires fine tuning (SWR) in their final mounting location. 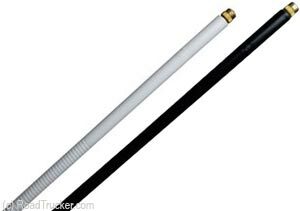 To tune an "FS" antenna, you just pop-of the tip and turn the adjustment screw up or down as needed. Available in 2 colors White (FS-3WH) and Black (FS-3BK).